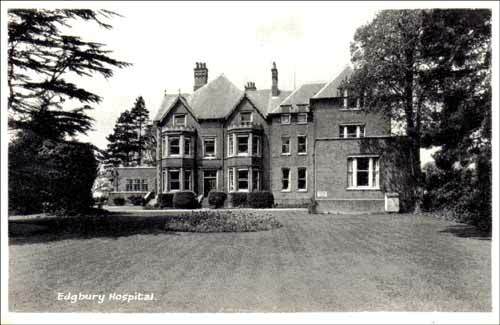 Three well-used convalescent homes once stood on Aspley Heath. They owe much of their origins to a book by Dr Williams, of Aspley Guise, who wrote in 1856 that this area was ideally suited to recovering invalids, and TB sufferers in particular. He analysed the annual rainfall and relative dryness of the atmosphere as compared to the usual European resorts that sufferers were sent to, and pronounced the area as being beneficial to their health. These notes have been compiled mainly from the unpublished research work of Arthur Parker. Daneswood (1891 – 1982?) still exists as a building, but has been converted into flats. It stands at the top of Aspley Heath, along Heath Lane. 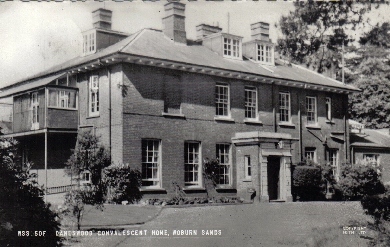 Daneswood was erected as a private residence before becoming a convalescent home. It dates from just before 1880, and we believe the first owner was James Charles Cleghorn. Directories place him there in 1890. He was possibly an architect, for it was he who designed the doors of the Church porch, and this house may have been built to his plans. He was followed there by Canon Bartlett, who gave much help to the Church, and he must have been Cleghorn’s tenant as it was only in October 1891 that Cleghorn sold the property to a group of Jewish Trustees which was headed by Henry Louis Bischoffsheim, with Sampson Lucas and Lord Rothschild. Here, they opened “The Jewish Convalescent Home for Consumptives”. 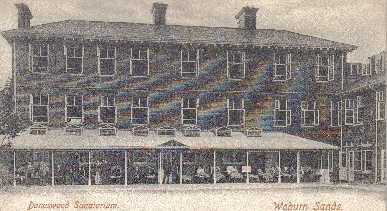 Owing to its patients and their visitors, Woburn Sands became well-known to the Jewish community in London, with some setting up in business here, and remaining for some years. Parker believed it became known as a place of refuge for them during both World Wars. It continued catering only for members of that faith until in July 1948, when under the National Service Act of 1946, it was taken over by the Ministry of Health and was opened up to all (and no) faiths. In July 1905, George Lee, the sole remaining member of the old besom-making family in Leighton Hollow, sold his cottage and garden to the Trustees, subject to his life tenancy, and in the garden they established a well, with pump house and engine. How the premises obtained their water supply before that is not known, probably by a well in the grounds. This new supply was connected in lead piping all the way up Sandy Lane to the Home, which had its own electric supply and engineer (who lived in the Lodge), and this supply continued until sometime between the Wars, even though in 1911 a mains supply became available. It was decided in the end to go over to the mains water, and before doing so the Trust had the main water analysed, with the result that it was announced to be one of the purest and softest waters in England, in fact too pure – they were advised not to pass it through lead piping. This caused concern as the whole of the house services were in lead, so the old pipe was all ripped out and replaced with copper, and from that time on the local plumbers recommended all supplies to be piped in that material. The late Sol Leadbetter told me that, as a builders’ apprentice, he was lowered down that well to sever the lead pipe as low as they could so it could be salvaged and sold for scrap! It closed in the early 1980’s(? ), and after being derelict for some years, was converted into flats. 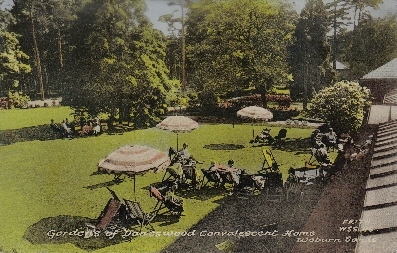 Postcards of Daneswood, the front and views of the rear, with original TB patients outdoor beds, and a more modern relaxed garden scene later. 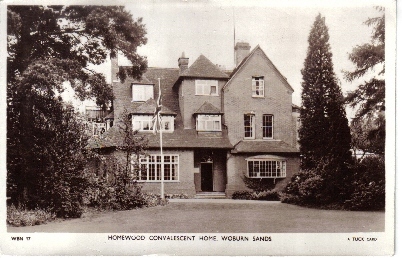 Homewood (1919 – 1968) once stood at the junction of Church Road and Sandy lane, at the very top of Aspley Heath. Frederick Croxall Boultbee began buying up land at the top of the Heath in in July 1885. He purchased several original squatters’ enclosures, including two acres along Sandy Lane, which was once used as a vegetable garden by Samuel Henman. Frederick Boultbee has a child buried in the Churchyard, so must have come here as a young married man. At Bedford Archives is a copy of auction particulars of the property when it sold on his departure and these are drawn showing the premises as a school – built with all ‘mod-cons’ for those days – with earth closets on the first floor. Parker could not find any other evidence that the place was ever actually used as a school or even that Boultbee was a schoolmaster but from the above it would seem he came here with the intention of establishing a scholastic connection, and Parker says that from other evidence, he had the ways of a schoolmaster. He must have been musical too, for it was he who founded the our local brass band, first known as the “Temperance Recreation Club” band, and for its headquarters and practices, he placed at its disposal a local cottage. Boultbee was a good churchman, and straight away entered into the life of the Church. He offered his services as churchwarden in 1884, but was defeated by a better-known tradesman, Mr Hudson. The Church records do not mention his going, but in August 1892, he had already established himself as the Rector of Colne in Huntingdonshire. 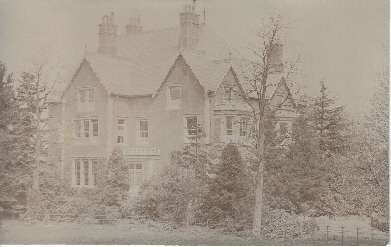 The property was purchased by Wilson Crewdson of St Leonards on Sea, and here Miss Crewdson, of Girton College, Cambridge, resided. 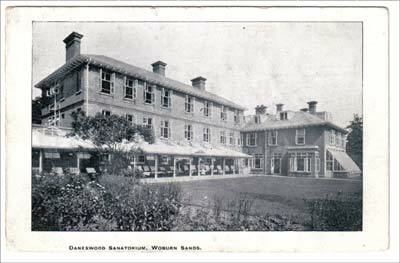 Wilson died in July 1918 and in October 1919 his executors sold the building to the Bedford County Council, as Trustees of the County Hospital, for £4,000. At the same time, Robert Eveleigh, a neighbour who had sold some of the original land to Boultbee, released the covenant which had restricted the use of the building to being a private residence. So the building was opened as a memorial of the First World War, and a convalescent home for the County Hospital, and through the Second World War, having been enlarged to accommodate 22 beds for patients of both sexes. From the local administration, it was later taken over by the Ministry of Health and eventually closed in 1968, and later the Ministry sold it. It had stood empty until it was bought in 1972 to be the home of Fernwood School, a nursery and pre-prep school, taking children from 12 months to 9 years, until that closed in about 2013(?) The house was pulled down in 2014 and three new houses built on the site. 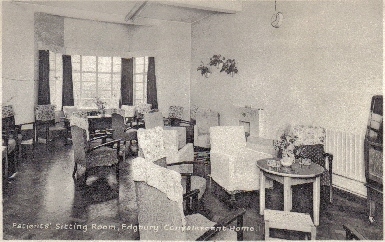 Edgbury (1920 – 1985?) once stood to the west of Church Road, Aspley Heath, at the end of Bishops Walk, just passed St Michaels Church. This began life as a small country mansion, the home of Alfred Allnutt. 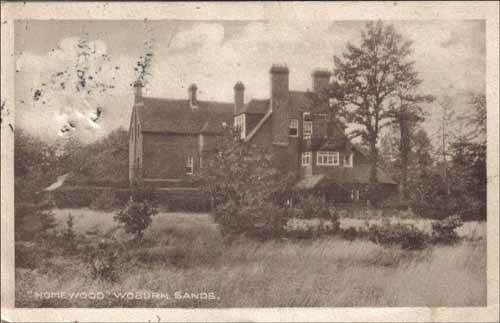 In the Autumn of 1885, he purchased 56 acres of the old Wavendon Manorial Estate from William Henry Denison, mostly comprising of what we now know as “Edgbury Fields”, running down to the Bow Brickhill Road. Parker says he never saw any suggestion of the name “Edgbury” on older maps, and did not know who were the original architects or contractors of the main house, but on the high corner of the estate, near the Church, Allnut built his imposing house. To complete the area, and for protection from development, Alfred had also bought the plots fronting Church Road, one adjoining the road round the Church on which he built his entrance lodge. 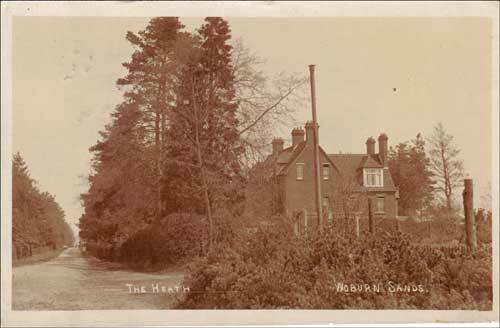 He also acquired other land adjoining and opposite, and also The Mount in Heath Lane. Allnut lived here until his death in 1913, at the age of 85 years. His grave lies near the south-east corner of the Church. He left a widow, and a son, the Reverend Percy Riddell Allnutt. The estate was held until 1920, when the Rev’d Percy sold it as a whole to Alfred Matthew Cawthorne, a London architect and property developer, and he immediately offered it for sale in small units, breaking up the homelands almost field by field. 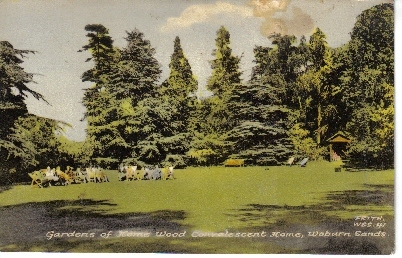 As soon as it came on the market in 1920, the house and grounds were purchased by the Duchess of Bedford, who, as “Sister Mary” already ran her well-known cottage hospital at Woburn. She set about converting the building into another hospital with an operating theatre and all the attendant offices. Yet very soon after her plans were put into operation, she suddenly cancelled everything, and the property was on the market again. As the work of conversion had already commenced, it was bought by the old Board of Guardians of Edmonton, who turned it into a convalescent home for women and children; the history of this district by Fulbrook School says with 115 beds, but this sounds too many for the inception. When Boards of Guardians were made obsolete in 1930, it was taken over by the Middlesex County Council and it was this body that made considerable additions to convert the place into a proper hospital. The cost about £5,000 and the work was carried out by Frederick Summerford of Salford. Further extensions were made in 1951, and many other minor improvements after. The property eventually passed to the Ministry of Health. It closed in the late 1980’s, and was later the Bedfordshire headquarters for Shanks & McEwan Waste Management Ltd. When they moved out, it was vacant for some time before being demolished. A luxury apartment development, known as Charlewood House, was built in its place. 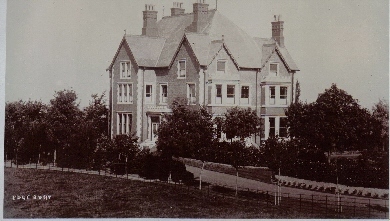 If you have any connection to the Aspley Heath Convalescent Homes, and can provide any more details, please let me know.